It seems like every few weeks we hear a report of an American unmanned aerial vehicle (UAV) lost in a crash somewhere in the world. According to The Washington Post’s Drone Crash Database , the US military’s had 237 ‘Class A’ mishaps involving UAVs since 2001 (although this database was last updated in December 2015 and more  crashes  have occurred since). That makes sense superficially. The US military is the most prominent user of these platforms and, logically, the more often something flies, the more often something goes wrong. But an examination of the data shows that this isn’t actually the case; the US Air Force’s (USAF) loss rate per 100,000 flight hours for the MQ-1 Predator  (USAF’s primary armed UAV during the 2000’s) actually decreased as it racked up flight time. As the ADF moves towards incorporating UAVs—including potentially an armed medium-altitude UAV  (see Para 4.55)—into its force structure, it’s worth looking at those findings in more detail. The MQ-1 Predator has been the mainstay of USAF’s armed UAV program since the late 1990s. Its use in conflict zones  around the world was kept hush-hush for many years, so little was known about its safety record. However, USAF now publishes detailed safety records  for the Predator that stretch back to the UAV’s secretive years, giving us a glimpse at its accident rate. Figure 1 shows the number of Predators destroyed and the Predator’s loss rate per 100,000 flight hours from 1997 until 2015 (data from 1996 was excluded as the aircraft only flew 200 hours that year). During this period the Predator had 122 Class A mishaps that led to the loss of 105 aircraft, meaning that 86% of Class A mishaps ended with a destroyed platform. While the number of Predators lost in the late 1990s and early 2000s is low compared to later years, the loss rate per flying hour was relatively high. 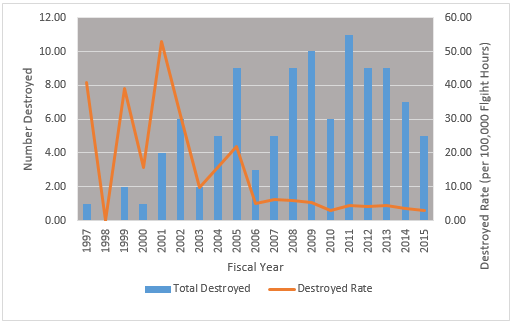 The late 2000s saw an increase in the number of destroyed Predators but the loss rate actually decreased to around 3–4 aircraft lost per 100,000 flight hours. That’s likely due to the aircraft becoming more reliable and its operators gaining experience in flight operations. Today the MQ-9 Reaper —a bigger and more capable version of the Predator—is becoming the USAF’s armed UAV of choice. Figure 2 illustrates the number of hours flown by the Reaper and Predator between 1996 and 2015. Both platforms had a relatively modest number of flight hours in the early stages of their lifespans. The Predator saw a rapid increase in the number of hours flown in the mid-2000s; the most prominent increase coming between 2007 and 2008 when its yearly flight hours nearly doubled from 79,000 hours to 148,000 hours. 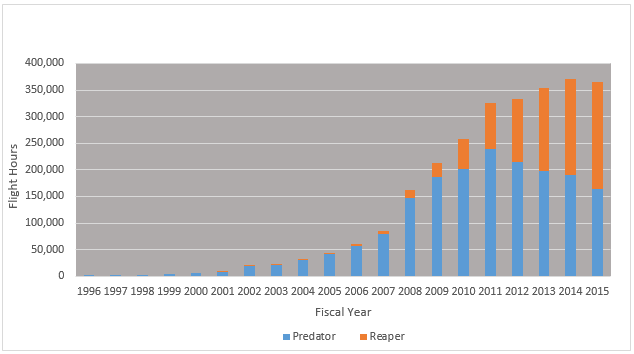 The Predator’s flight hours peaked in the early 2010s before being overtaken by the Reaper in 2015. The Reaper’s followed much the same track as the Predator; its flight hours slowly ramped up as the platform matured. It then saw big jumps in flying hours as it demonstrated its operational value before overtaking the Predator. What’s interesting is that the Reaper’s destroyed rate  is still fluctuating, as shown in Figure 3. 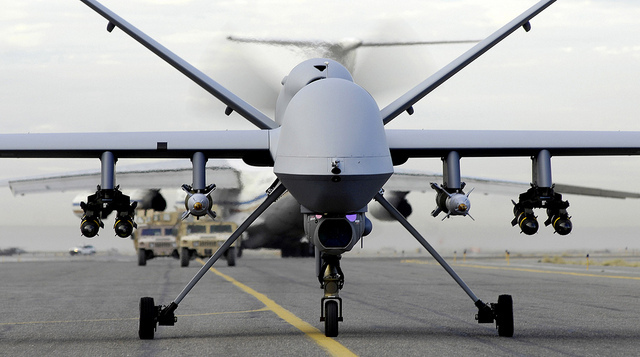 No Reapers were lost in the early stages of the platform’s life, likely because the basic teething problems facing UAVs (such as navigation, communications, and reliability) had been worked out during the Predator’s development. 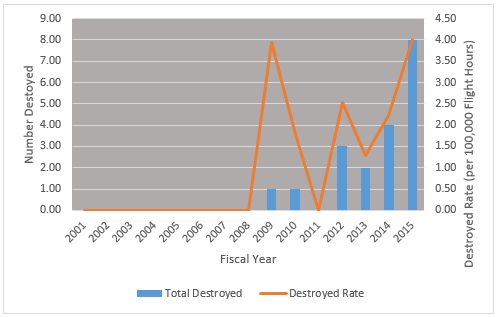 As Reapers began flying more often in the late 2000s and early 2010s, the number of aircraft destroyed (and the destroyed rate) increased. However, the fluctuating Reaper loss rate during this period looks an awful lot like the Predator’s loss rate in the corresponding stages of its life. Since the Reaper was able to skip some of the basic problems associated with UAV development, it’s likely that the platform is now working through some of the unforeseen issues inherent to aircraft development. The high loss rate could also stem from the fact that the platform is conducting more demanding operations. If the Predator’s experiences are any indication, we’ll likely see the Reaper’s loss rate settle down to a significantly lower figure. This shouldn’t worry the ADF much: accidents are an inherent part of aircraft development. If Australia decides to use armed UAVs in conflict—and its looking increasingly likely that it will —it needs to develop contingency plans for dealing with crashed UAVs in hostile territory. The US military tries to destroy downed UAVs if they can’t secure the wreckage with ground forces. Whether Australian (or allied ground forces) are available to secure a downed Australian UAV depends on the situation, but it’s unlikely that Australian UAVs would operate where there’s no prior Australian or coalition presence. As long as those plans are in place, Australia won’t have to worry about its UAVs falling into enemy hands when one of them inevitably crashes. Christopher Cowan is a research intern at ASPI. Image courtesy of Flickr user Think Defence.